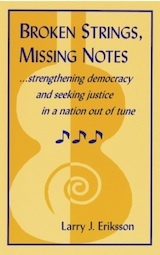 ...strengthening democracy and seeking justice in a nation out of tune by Larry J. Eriksson. First Edition; 5½ x 8½; 384 pages; ISBN 0-9721875-1-0; 2005. Reader responses..."a wonderful book," "a desperately needed vision," "one of the most engaging books of nonfiction I've read this year"
Published in 2005, this book discussed the threats to our democracy in the aftermath of the 9/11 attacks. It foreshadows many of the economic, political, and moral problems we are facing today as our values and democratic institutions are under attack. We live in a nation that is out of tune. Partisan disagreements grow ever more strident as the gap between the rich and poor grows ever larger. Broken Strings, Missing Notes speaks to those seeking to build a more just, humane, and sustainable society. It uses a metaphorical model of our democracy based on the violin to unite its various themes. This model is the inspiration for the title of the book as well as its goal -- to ensure that there are no longer any "broken strings" or "missing notes" in our society. 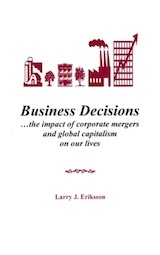 ...the impact of corporate mergers and global capitalism on our lives by Larry J. Eriksson. First Edition; 5½ x 8½; 224 pages; 9 illustrations; ISBN 0-9721875-0-2; 2002. Reader responses..."thoughtful, insightful,useful," "prophetic," "well reasoned and documented scholarship"
Published in 2002, this book provided an early warning of the dangers from the corporate colonization of Wisconsin through corporate mergers. Aa a result, absentee owners in distant corporate headquarters control the economic future of local communities. More recently, we see the Foxconn project exploiting Wisconsin resources including money, land, water, air, and workers to benefit distant owners with uncertain risks and benefits for our state. Yet another example of what it means to become a corporate colony in a globalized economy. Business Decisions offers innovative suggestions on how we can build communities and businesses that are more humane and inclusive, focused on people rather than numbers -- where business decisions become people decisions.